If someone threatens to sue you for using a common word, whom would you go to for redress? Well, if you’re a writer, or a mom-and-pop business owner, you may not be able to afford a team of lawyers. You may not think that a common word such as ‘think’, ‘eat,’ or ‘whisperer’ could get you into the cross-hairs of a team of copyright lawyers. But we live in such times. Last week I spoke to Bo Mueller-Moore, someone who didn’t understand all of this. Bo is a Vermont-based folk artist who became an accidental T-shirt designer. We grow kale (as you could see here) in our back yard. This story resonated with me. He comes across as a folksy, genial gentleman who might be the least likely chap to threaten a 1,615-restaurant business. 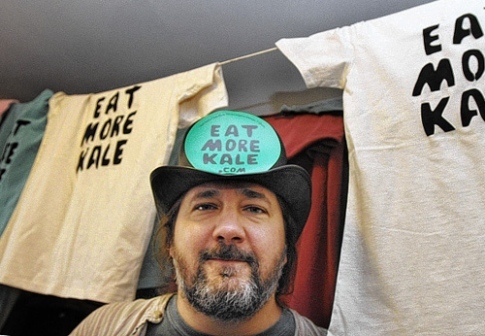 One of his shirts that he sells (he originally made three for farmer John down the street) read ‘Eat More Kale’. But a corporation began claiming the rights to the words ‘Eat’ and ‘More’ and thought that Eat More Kale would confuse its customers. Bo has been imprinting t-shirts since 2000, and this is not the first time Chick Fil-A has come after him. (It dropped its earlier case after someone from his town sent them a polite letter saying they were going after the wrong kind of person who was no threat to them. ).The company’s product? Chicken sandwiches. Sandwiches! Last year the lawyers sent him the second cease-and-desist letter. This time Bo decided he was going to fight it another way, in another court –the court of public opinion. Which is located …in the realm of social media. He took to Facebook, and YouTube, and has garnered thousands of fans. Oddly enough, while you hear of similar cases (Facebook, apparently tried to own the word ‘book,’ and Apple tried to make claims on the word ‘pod’) others who common English words don’t always get into this kind of trouble. Denny’s restaurant is currently using the word ‘whisperer’ to promote its fare. The series of videos is called ‘Skillet Whisperer.’ (The word whisperer immediately conjures up the movie Horse Whisperer, doesn’t it?) Some folks in Wisconsin have a website called Eat More Cheese. Now they are definitely in the food category, even though a slice of cheese is a far cry from a piece of chicken. If I were a PR agency advising Chick-Fil-A, I would tell them stop wasting their budget on expensive legal advice and allocate a tiny portion of that to a dude in the office who would listen to the awkward chicken-unfriendly conversations going out there in the blogosphere. Better still, it could try to repair the relationship and channel the conversations away from anti-chicken talk. How? How about a seasonal chicken sandwich with Kale instead of lettuce? That would be a nice gesture to the farmer John’s of this world. It may be wise to look back at how United Airlines got the ‘message’ when Dave Carrol took his story to YouTube, and did an admirable job of tuning in, and toning down the voice of an angry customer plus his millions of fans. Gimme a grilled, spicy chicken-kale sandwich, Chick Fil-A. I’ll eat mo. I promise! PS: My wife grows eggplant, parsley, and chilli peppers. On her behalf, eat more eggplant! Eat more chillies! Eat more kale, too!